This week three great companies May Arts Ribbon, Little Yellow Bicycle, and Xyron are teaming up to bring you projects all week long. I had the chance to play with beautiful ribbons from May Arts, pretty ‘Poppy’ pattern papers (say that 3 times fast) from LYB, and the most innovative adhesive from Xyron. I created a paper banner for my kids playhouse. The fun ribbons I chose for my paper banner- chevron twill, bakers twine, and faux canvas. 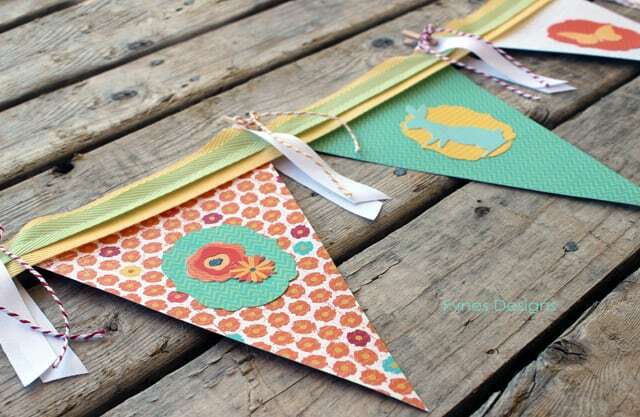 The poppy pattern paper triangles are sewn directly to the lengths of May Arts ribbon. I used xyron create a sticker to attach the centre decals. The cute flowers, bunny, and butterflies are also from the LYB Poppy collection. Hop along to see the other projects featured by my friends, Sandy Allnock and Leah Farrar-White. So cute!! Love the little streamers in between the pennants!! Adorable!! I just LOVE your banner! The sewing of the twill ribbon mixed with such beautiful papers makes the whole project look like its made from fabric. Just beautiful! You made such a fun and creative banner! 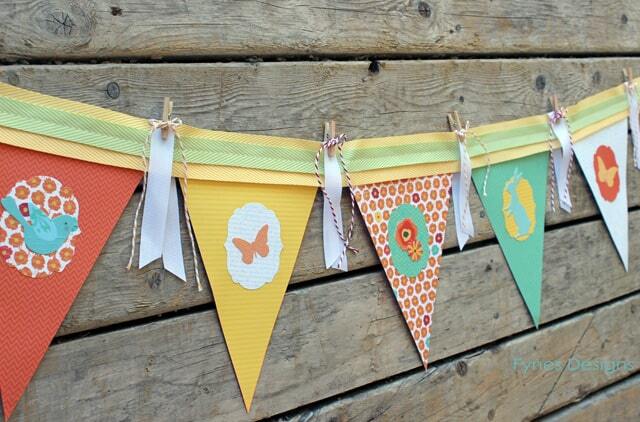 I really love the bright colors and your photo really captured how nice the May Arts ribbons you used! Thanks for sharing! HOW FUN … and how Summer-y, too. Genius. I love it. Very cute banner. I like your choice of papers and ribbons. Cute banner for your kids’ play house. Oh I bet you kids loved this on their play house!! Cute! Makes me wish I had a playhouse! Sweet banner — the ribbon really adds to the effect! what a happy banner with all of those gorgey ribbons! This would be such a fun project for a gathering. I love the May Arts ribbons and those tiny little clothes pins are adorable. I have a bunch of them and never knew how to use them. Your color choices are just great. LOVE this! That is certainly an awesome banner and done so artisically. And, no, can’t say that fast three times at all. LOL But had fun trying. Cute banner. Wonderful use of the ribbons!! Super cute banner. !! This is going to be a great week . Very cute banner! I love that chevron twill! Such a fun and cute banner. I love how you used the ribbon and twine. Very cute banner. I bet the kids love seeing it on their playhouse. Well, what clever talented girl you are? This banner is simply lovely. Beautiful Banner Virginia!!! 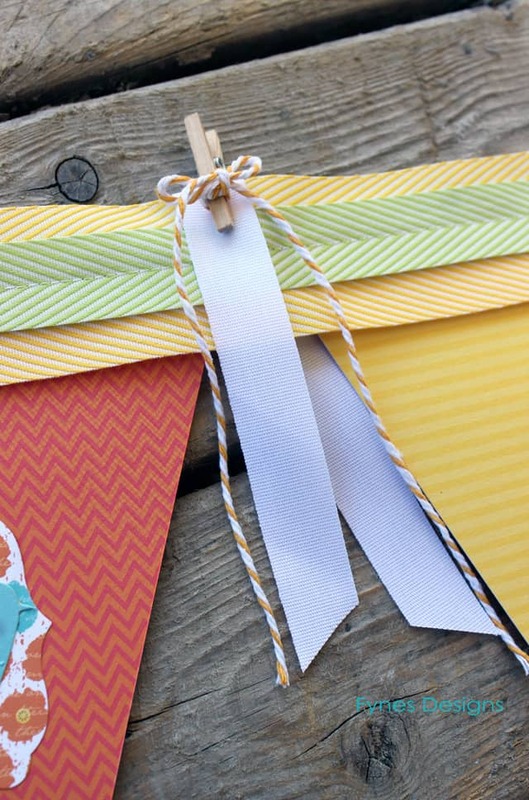 Love the ribbon selection you used, the colors are so bright and cheery! That is the fanciest banner I’ve ever seen. LOVE IT! Oh how cute! I love all of the little details, like using 2 different ribbons for the string. Nice. Great banner. Layering the ribbons was a good idea. Love the green and yellow. what a sweet idea..I bet they will just love it, it’s fresh and colorful. great idea!!! Nice, I’ll bet the kids just loved the banner ! Thanks ladies for checking out my project today. I’m keeping my fingers crossed one of you gets your hands on this sweet treat! Awww, so cute and love the way you used ribbon on that darling banner! What a fun, bright banner, I love it! Thanks for sharing. I am a huge fan of banners so of course this is one of my favorites! Unique fun summer banner that is so cute. Great job. Awesome banner. The decals look amazing. I bet they machine made the work much easier! This banner is so bright and fun!!! Love how you alternated colors and designs so that every single element on the banner would stand out! Thanks for sharing and for a great opportunity to win! Such a sweet, cheery banner! I love the way you used the ribbon. I love making banners! Yours is so great, lots of fun ribbon uses! They make such a big impact and so many more people can enjoy seeing our craft than when in an album. I love the details and colors! This is the cutest banner I have ever seen! I love ribbon. What a lovely banner ! Lucky playhouse ! Lucky kids. Loved the twill ribbon. Nice to meet you and thanks for the chance to win. I love the double layer of chevron ribbon!! Great banner! Such an adorable banner! I love all of the ribbon. Makes you want to celebrate! I love the mix of colors, patterns and images! The ribbons look fabulous, too! Thanks so much for sharing and inspiring! Beautiful banner! Love those ribbons! Love the banner – especially the colors you used. Thanks for sharing! Love the banner, it’s so cute! 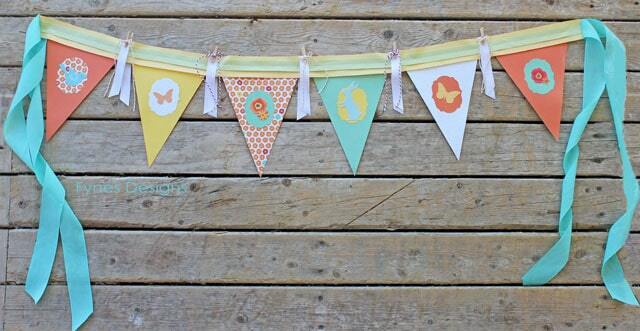 Awesome banner – love the little clothes pins! Adorable banner-it has a bunny! We are just seeing baby bunnies out on our neighborhood walks again, saw the first little hoppers yesterday! We live in bunny central right now! My kids love to ‘catch’…chase them! Banners are all the rage lately and yours is something to rage about! Beautiful!